Sister Judy Kramer left last week for El Paso, Texas, where she is helping to provide assistance to immigrants. S. Judy is responding to a call from the Leadership Conference of Women Religious (LCWR) for communities across the United States to send helpers. Please pray for S. Judy, her co-workers and for the immigrants they serve. 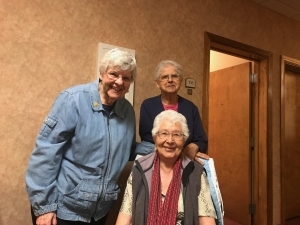 Sister Judy Kramer (left) with two Victory Knoll sisters.